Hood River Hobbies RealFlight RF7.5 R/C Flight Simulator InterLink Elite Controller EditionWhen it comes to learning and honing R/C flying skills, RealFlight has no equal. the InterLink Elite is incredibly realistic and easy to use. It’s versatile, too, with digital trims, QuickSelect™ convenience — and 8 channels for direct access to all RealFlight features with no setup required. The controller is dedicated to RF7.5, so you save wear and tear on your transmitter…and no batteries are required to keep the controller charged and ready. 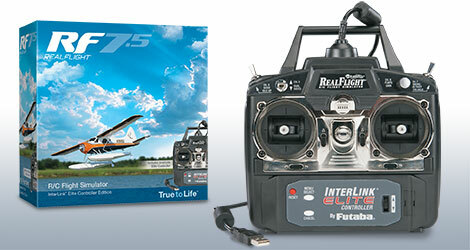 Fly with the InterLink Elite, fly with your transmitter using the built-in interface, or use the interface and InterLink simultaneously with the MultiMode™ feature.